(Bloomberg) -- The best-quality oil is fetching the highest premium in more than two years, weighing on profits at Mediterranean refiners that depend on Libyan crude. North Sea Dated Brent, Europe’s benchmark low-sulfur crude, sold for $7.11 a barrel more than Dubai crude, a Middle Eastern high-sulfur oil, on April 11, according to data compiled by Bloomberg. That’s the highest spread since October 2008. Brent’s premium to Iran Heavy crude has doubled from January’s average. Nine weeks of civil conflict in Libya is crimping supply of lower-sulfur “sweet” crude, which is more easily refined into cleaner-burning fuels, pushing up prices for comparable grades from the North Sea and Nigeria faster than “sour,” high-sulfur blends from Saudi Arabia and Russia. That helps Finland’s Neste Oil Oyj, Hungary’s Mol Nryt. and refiners set up to turn sour crude into fuel for cars or jets, while hurting Mediterranean refiners such as Saras SpA and Hellenic Petroleum SA that can’t easily switch away from low-sulfur grades. Libya accounted for 8.8 percent of global light, low-sulfur crude supply in 2010, according to JBC Energy GmbH, a Vienna- based consultant. Oil output from the North African OPEC member is down 75 percent as fighting between rebels and government troops forced producers such as Marathon Oil Corp. to evacuate workers. Prices are rising for low-sulfur grades from Nigeria, Algeria and Azerbaijan, as well as those in the North Sea. Nigerian Qua Iboe’s premium to Brent rose to $4.13 a barrel on March 30, the most since July 2008. Mediterranean refiners, being closest to Libya, tend to be the most reliant on its crude. Saras, which operates the Sarroch refinery in Sardinia, imported 47 percent of its crude from Libya in 2008, according to its website. Saras plans to discuss the impact of the Libyan disruption at its general meeting tomorrow, Rafaella Casula, a spokeswoman for the company in Milan, said yesterday. She declined to comment before the meeting. The Italian company was more reliant on Libya than Repsol YPF SA, Spain’s biggest oil company, which bought 16 percent of its crude from North Africa in 2009, according to its website. Hellenic Petroleum relies on Libya for as much as 12 percent of its supply, John Kostopoulos, chief executive officer, said in February. Athens-based Hellenic may be “competitively disadvantaged” by the rising premium for sweet crude until it finishes a 1.2 billion euro ($1.8 billion) upgrade at its Elefsis plant, Jefferies’ Ekstein said. Hellenic has had to switch to other sources of light-sweet crude because of lost Libyan supply, a spokesman said from Athens, declining to be identified by name in line with company policy. OMV AG, one of the oil producers forced to curb output in Libya, is adapting its Burghausen refinery in southern Germany to process crudes from other countries. Vienna-based OMV ran about 20 percent of its capacity on Libyan oil before the crisis began. OMV told investors the crisis in Libya will cut earnings before interest and taxes by an estimated 20 percent, Philipp Chladek, an analyst at Raiffeisen Centrobank AG, said in an April 20 note. Sven Pusswald, a spokesman for OMV, declined to comment on profit. 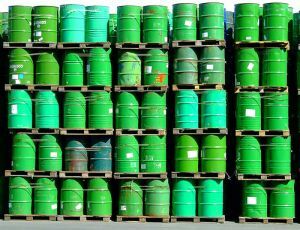 European refiners may find it harder in coming weeks to get suitable crudes as they return from seasonal maintenance, the Paris-based International Energy Agency said in an April 12 report. “The impact of the lost supplies has so far been muted by the fact that European spring turnarounds hit a seasonal peak in March,” the agency said. Refinery maintenance is mostly timed to allow refiners to maximize production of gasoline in the European summer and heating oil in winter. Russian Urals’ discount to Brent in northwest Europe fell to $4.30 a barrel on April 12, compared with a $1.90 discount at the beginning of the year. That helps refiners including Neste Oil, which operates refineries in Naantali and Porvoo in Finland and gets most of its crude from Russia, according to AlphaValue, a Paris-based research company. “Plants that can handle Russian crude are doing well right now,” Credit Agricole’s Barret said from London. Many refineries in former Eastern bloc countries such as PKN Orlen SA’s Plock facility were designed to handle Russian heavy crude and are still linked by pipelines dating back to Soviet times. Neste’s stock gained 12 percent this year, compared with a 4 percent advance in Europe’s Stoxx 600 Oil and Gas Index. The company, based in Espoo, Finland, gets 70 percent of its crude from Russia and none from Libya, according to Kaisa Lipponen, a company spokeswoman. While Saudi Arabia has increased production to offset the drop from Libya, its crude isn’t a good substitute because most of its output is higher in sulfur than Libyan crude. Putting a lesser quality crude through a refinery’s processing units can yield inferior fuels. Most Saudi crude, including Arab Medium and Arab Extra Light, contains more sulfur than Es Sider, the Libyan benchmark. Saudi’s Extra Light contains 1.16 percent sulfur, compared with a 0.44 percent threshold for Libya’s Es Sider, according to Energy Intelligence Group. Saudi Arabia developed two new blends with reduced sulfur content in response to the Libyan shortfall. The blends have seen a “lukewarm response” from European refiners, Amrita Sen, an analyst at Barclays Plc, said in an April 14 report. Tupras Turkiye Petrol Rafinerileri AS, the operator of refineries in Turkey, is buying more Saudi and Iranian crude for its plants, making it one of the beneficiaries of the discount on Middle East grades, Tamas Pletser, an analyst at ING Groep NV, said by phone. “Tupras is a major buyer of sour crudes, so this expanding margin is likely to be replicated in the company’s own margins,” he said. Tupras gained 26 percent this year on the Istanbul Stock Exchange, outperforming a 4 percent rise on the ISE National 100 Index, Turkey’s benchmark index. Tupras officials in Izmit weren’t available for comment when called yesterday.